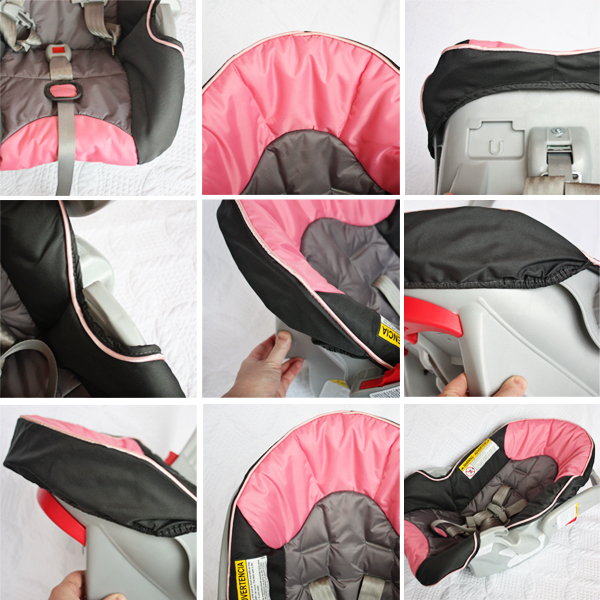 Do you love your infant car seat……but hate the cover? Is the material scratchy or stained? Torn or outdated? Well, then start picking apart that old one……and making it into a new one. While searching for a new car seat, I wasn’t loving any of the fabric. I know, not really all that important, but if I can re-cover it……why not? And then turned it into a fresh and original car seat cover. And I know, these little satin flowers are seen here, there, and everywhere. But I couldn’t resist a little girliness added to the seat. I even coordinated the little seat belt shoulder covers. And yes, the canopy was completely re-done as well……. The car seat cover tucks around the seat frame in the same way, keeping the seat nice and tailored to its specific size and dimension. And of course, a little label attached to the side……marking my work. Nice and bright and perfectly fitted to our new car seat. This seat is happily awaiting the arrival of our little girl. Perfect. Would you like to see how I transformed the original car seat cover into a new one? First of all, I purchased the yellow fabric at HB Fabrics here. (Alexander Henry Amelie in Yellow, Matisse Collection) And I bought the gray fabric here. (Ty Pennington, Lace Taupe) I actually purchased the thicker Decor Fabric in the grey because I knew I’d be using some of it for the canopy, and wanted it thicker. It has a nice sateen finish and is very soft. But the Ty Pennington collection also comes in the regular weight cotton. I purchased 2 yards of the yellow and 1 yard of the gray. But the amount of fabric you’ll need depends on how much fabric you need for your canopy, how much of the old canopy/car seat fabrics you use, how much of each color you use on the car seat, etc. I didn’t hate the color scheme/design of this car seat……..but it wasn’t exactly what I wanted. And even though the fabric was a bit slick, and would have wiped well, my babies tend to be sweaty and the fabric wasn’t very breathable. **I used the exact padding and sizing…….keeping the cover true to its fit inside of the car seat. So it is exactly the same size, fits the exact same way, and will be just as safe as the original. Before taking anything apart, I took pictures of the car seat from every angle, so if I had any questions later on, I could take a look at how something looked. Then, I started picking apart each piece of the car seat, using a seam ripper to carefully un-sew each seam. Each piece had a top layer of fabric and then a layer of batting. I had to pick apart each fabric piece from its batting piece as well. Then I used each fabric piece as a pattern and cut out each piece in the color that I wanted. **You’ll see that the gray piece at the bottom (where the feet would go) didn’t make it to the final car seat cover. I changed my mind at the end and swapped it for the yellow fabric. Then I placed each pattern piece with its appropriate batting piece, pinned them together with the fabric facing right side up, and zig-zagged around the entire piece. Then I made seams in the appropriate places, just like on the original pieces. Seams such as these just allow the cover to bend at the appropriate spot. Now your car seat cover may look differently in some spots, but mine has a hole where a narrow strap comes out to be able to adjust the tightness of the shoulder straps. I took the original fabric piece, placed it on top, and traced the size of the opening. As you deconstruct a tricky area such as this, take pictures and pay close attention how to put it back together. Mine had another piece of fabric that was used to finish off the opening. So I recreated mine in the same way. I used the original fabric piece (shown above) to draw the right square size on there too. Then I placed the fabric square right side down, lined up the 2 squares, and sewed right on top of the traced square shape. Then I cut the square open, trimmed down the edges, then cut slits in towards the corners of the square, allowing for turning the fabric in the next step. So next, shove the fabric through the hole, flipping the fabric out to the back side. Pull the fabric square towards the back, nice and snug, and pin in place. Then sew around the square opening. If you turn this piece over, you’ll see the square on the back side. I trimmed the square with pinking shears, to help avoid fraying. But you could also zig-zag the edges before attaching the square several steps ago. Now, onto the center piece of the car seat, where the slits for the straps go. I placed the original piece over the top of my new piece, and marked little dots at each side of each slit with a pencil. Can you see the little dots that I used to mark the width of each opening? I then used those dots as a guide, and made button holes that were the same width and the same location as the original openings. Then I used a seam ripper to slice the button holes open. The rest of my pieces were basic, with no other tricky parts to it. So I referred back to my first picture, and started putting the pieces back together. I used pins each time I put 2 pieces together, and then sewed it together……..keeping things very precise. You want to put the top of the seat together by itself……and then the bottom section. And then sew the 2 sections together. This can be tricky to maneuver under your needle, so do it slowly. Next, I took some shortcuts. I used the original fitted pieces, that keep the cover tucked into place over the car seat. The color matched perfectly and saved me some time. Perfect. But you may need to use your original pieces to cut out new ones that match your new fabric……..but I just don’t have pictures showing that step. So I just skipped to adding the fitted sleeve to the top of the seat cover, with right sides together………. ………and to the foot section of the car seat as well. Now slide your cover onto your seat…….it should fit exactly the same way your original one did. Are you ready to tackle the canopy? Make sure to take pictures just like you did with the car seat cover. You don’t want to forget how anything looked. **If you are taking apart an old GRACO canopy, the main plastic pieces of the canopy attach like shown in the image below, right at the center of each piece. You will have to hold on either side of the center of the arch, and tug really hard to pull them apart. Then slide them out from each end of the canopy. Then I picked all of the pieces apart, just like I did with the car seat cover above. Each section has a light pink piece of satin material on the underside that I peeled off the top piece……but didn’t take a picture to show you. My canopy had 2 little tube sections down the center, that housed little plastic piping pieces. So I made sure to duplicate those strips of fabric, sewed them into tubes the same way as the originals……. ……….then sewed the tubes right to the center section of the canopy (just like it was done on the original canopy), with the raw edges matched up with the outer raw edges of the center canopy strip. ……..and sewed off each end with a zig-zag stitch, keeping the plastic pieces securely inside. Now, the back piece of my canopy has a casing to slide the main plastic structure of the canopy. I cut the strip for the structure just like the original, then serged the raw edge (you can zig–zag it too). The front of my canopy, has a little extra fold down strip, which is how the front casing is actually attached. So I re-created it the same way as the original (and serged the lower raw edge like the one above), but this time, the casing was sewn with the right side of the fabric facing down. And remember to tuck the ends under again like shown above. See, this is my very front piece, with the gray color on the outside. The next step, is to attach that front strip to the next canopy section. I placed the two strips together with right sides together, then sewed along that edge. Then I folded that casing piece away from that more narrow front canopy strip. Attach the other canopy sections in the same way, creating the domed shape. Then use the original bias tape like I did, purchase some, or make your own (click here for help) and encase each raw seam where each canopy section was sewn together. Now, again, remember that not every canopy style is the same, but mine has a little extra piece of plastic boning along the front. This helps that little extra addition to the canopy at the front to keep it’s shape. So, because the next step is to attach bias tape all the way around the canopy, you’ll use the bias tape as a casing for teh boning along the front for this style of canopy. So I attached the bias tape along the front only……. ………then slid the plastic boning on in. Then I finished attaching the bias tape the rest of the way around the canopy. Now, if you have a GRACO brand car seat, the main plastic pieces attach like this right at the center of the arch of the canopy. (If you were taking your canopy apart, you would need to pull it apart, by tugging really hard.) To put back into the canopy, slide one piece into each side, and slide each piece back into each other. 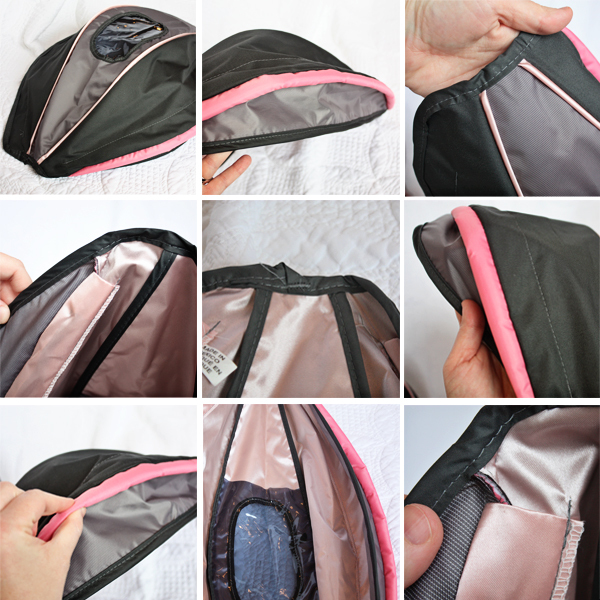 Then attach the plastic pieces to the car seat……..allowing your canopy to stand up. Last step……the seat belt shoulder covers. I then zig-zagged around each fabric piece, attaching it to the original piece of batting. Then, I made my own bias tape (click here for help) and attached it to the raw edges of each shoulder cover. And lastly, I attached the velcro to each strap……just like the original ones. And that is it. Whew. I know, a lot of steps. WoW! This looks amazing. It looks like a lot of thought went into it, and I love how it turned out! What a thorough tutorial. It does look amazing! Sewing skills out of my league but definitely amazing! That's fantastic!!! I have made carseat covers and I KNOW how much work that is, but your method is so awesome! It looks so professional, fits perfectly, and it's still safe. And the canopy, genius! I remade the canopy but did not use anything from the old canopy. I couldn't find boning stong enough, didn't use fabric stiff enough, and the canopy was always flopping around – disaster. I will definitely be using your tutorial when I need to recover it again. Thank you SO much for sharing! ITS NOT SAFE!!! ANYTHING that isnt part of the seat when you buy it VOIDS VOIDS VOIDS!!! the munufacturer warranty!!! DO SOME RESEARCH!!! Cute does NOT NOT NOT = SAFE!!! Amazing! You make it look so easy! I will definitely be saving this tutorial for the next baby. wow! I actually like my carseat cover but I may try this if I ever want a change. Wow, I'm amazed! You are so clever! I may just get brave enough to try this. Thanks for an awesome tutorial! You make me want to have another baby! Wow! It's soo pretty. If you don't mind telling me..where did you get that yellow print fabric? I've been looking for it to do my bedroom :). Thanks for the awesome tutorial too! I just re-did mine as well! I'm still working on the canopy, but I got the seat part finished (just in case this guy comes right away-probably wishful thinking). I love your yellow fabric…so nice and bright! holy camoly……that is the BEST sewing job – that looks so difficult to me…..love the colors chosen too! This is absolutely incredible. However, I won't be showing this to my husband, because he would be begging me to recover both of our car seats immediately!! You are very talented! Love it! You will be getting a million compliments on your car seat. Everyone will be asking where you bought it! this is amazing! gives me options when i have a child, but also could be way above my current skill level. love your step-by-step instructions! I am so impressed! When we bought our carseat, I splurged the extra $5 to get the cute girly version. I'm now positive that because I did so, our next child will be a boy! I'm so using this tutorial and recovering it if that's the case. I love how detailed this is – and the pictures too! Thanks! thats amaxing! I'm going to have to try it when we have another baby. The above poster is right that not only would using something like this will void the seat's warranty, but this has also not been tested with the seat. It could cause the seat to not function properly and could cause injuries to the baby. The fabric (or anything that is behind the baby that shouldn't be there) could bunch up and push the baby forward in an accident causing neck injuries- which would not be good on a newborn! I would recommend speaking with the manufacturer to see if they would recommend this and alco getting the seat checked by a CPST. Just when I think you couldn't possibly outdo yourself for creativity, you do it again! What a great idea! This looks so amazing!!! It's so original too – I always notice in church that there are always at least 3 people with the exact same car seat. This one looks so original and fancy! I need to ask, how difficult was this project? I have been thinking of making one for our new addition this summer, but keep putting it off based on what seems like an incredible amount of time and effort involved. wow!! you are amazing!!!! if i send you our carseat cover and canopy will you make us a new one?! i am so not skilled enough to do this myself. haha!! I appreciate the comments and concerns about the warranty and such. This is a fun project to do, but one must also be smart before altering a car seat cover……and I completely agree. My car seat cover is exactly the same as the original, with the original batting and fabric thickness used……not adding any extra bulk or shape to the cover…..or any extra thickness below or around the baby. Therefore, it will perform the same as the original car seat, in the event of an accident. But as for the warranty, I do understand that it is now void. So I am willing to take that chance to have to re-purchase a new car seat without being provided a new one, in the event of an accident. So the choice is yours. I've just provided a tutorial on how to create an exact replica of your original without altering the design or shape or thickness. And without having to spend the money on a new car seat, should you want a new cover. But use your best judgment. Absolutely beautiful…you make something "hard" look really easy. The suggestion about taking pictures as you take things apart is a great idea. Thanks again for the beautiful work. wow one of your best projects yet! I have loved your blog from afar for a long time now. I finally decided to comment! First, this is amazing. I am learning to sew and come to your blog every single day to get inspiration and hopes for skills like yours someday! :) Second, this cover is for YOUR baby. You can decide to recover the car seat if you would like to (thanks for sharing it with us). I am so impressed! WOW! This is amazing! You totally make me feel like I could do this. I just made your stroller/messenger bag the other day and was RIDICULOUSLY proud of myself :) I just learned to sew a year ago and am so in love with it. Thanks for all of the great inspiration and tutorials. You are awesome! amazing! I don't think I apt enough to do that but you sure make it looks so easy. Great work! Holy cow, you are even more amazing than I previously thought! Fabulous job! I really love it and wish I could get myself to do one for my sweet baby girl! That is totally cute. If I ever get around to learning how to sew (and get good at it and have another baby), I would definitely do this with our infant seat. Also, just to put in my two cents about the safety of this, I personally think that it is fine. You are using a lot of the original materials from the cover and modeling it exactly like the original in design and thickness among other things. The original cover is tested to ensure its safety, but I am positive that they don't test every cover that they sell. Rather they just test a model and if it meets whatever standards, then they replicate that model. What is being shown here is pretty much the same thing. Additionally, I think that the disclaimer and its placement are perfectly adequate (I find it kind of absurd that you should have to include one in the first place — people can't think for themselves? But Ashley, who is not a carseat expert, told me I could do this, and no I didn't bother checking the user manual for the carseat so that I could know the manufacturer's policy on this…). If someone is going to do the carseat cover, I imagine that they would carefully read the instructions (all of them and before beginning the project as well as during) and then they would easily notice the disclaimer. Nice work! Thanks for taking the time with pics of each step. Thank you so much for posting your pics and your process! I've been considering doing the same thing to our infant carrier, but was a little gunshy — the suggestions of taking tons of pics is so simple, but so genius! Beautiful! I love our car seat cover but hate the seat itself so I've been thinking of getting a new one for the next baby…maybe I'll take up an offer for a used (but pretty new) one and just make my own cover. Thanks for the tutorial, I am definitely bookmarking this! I love the color combo you used! Fantastic. Maybe this is a stupid question, but was this a ton of work (with all the seam ripping?) As in, how long can I put this off before my due date??? Wow you are so brave! I'd be so afraid of taking it all apart and then not being able to get it all back together! I love it! Thanks for taking the time to do the tutorial!! While the cover is beautiful and well-sewn, your claim that this style of recovering project will perform the same as the original is really just a guess, isn't it? It is the same as any other after-market product in that we have no clue how it will perform. It may be safe or it may not be. We have no way to know until it is put into a real life crash test. Warranties and insurance are the least of my concerns when car seats are involved. This is your child's life. Are you really worried about the seat warranty? The real question is, Do you want your child to be the crash test dummy just so your seat can look pretty? Wow. That's incredible. I can't imagine how long that must have taken you. And as far as the worriers go, we're all (for the most part) grown adults capable of making rational decisions. One person's decision may be different from another's. But implying that someone is a bad mother and is willing to risk her child's life for a cute car seat cover is just inappropriate. That's beautiful! I can't believe how talented you are! Thanks for sharing- I'm definitely going to use your tutorial when I get down to doing a carseat! Oh my gosh! Incredible! I hope that one day I get strong enough sewing skills to pull this off :) Thanks for the tutorial!!!!! You did a GREAT job! Thanks for the tips as I'm starting this project for my daughter this weekend. That looks wonderful :) Great job momma! Great now I want to have another baby just so I can recover the car seat! So cute!!! I don't have kids yet, but when I do, I'll be pulling this tutorial out for some help with recovering it!! This is WONDERFUL!! Your steps make the process so much LESS scary & difficult. Thank you for taking the time to document this and share it with us!! I know it must have taken awhile to post, but THANK YOU!! You are so talented! Honestly, I usually see tutorials and think "I can do that." But right now, I know I cannot. And I would be totally overwhelmed to try! You rock girl!!! You are an amazingly talented person. But I think it is a tad irresponsible of you to make something like this and acknowledge that it is not recommended. The whole point that the car seat manufacturers make is that the seat might not be as safe with a homemade cover. Why risk your baby? Much safer to put a cute blanket over the top of the properly secured baby. I've made these for friends as gifts. They are a lot of work but they turn out so great. I bought my tutorial and this is exactly they same as theirs. Yours looks amazing! This is so adorable! I'm going to have to try this out if/when we have another baby. I think using a laminated fabric (Amy Butler has a line) would be awesome too! Bonus points for wipeable! Thanks for all the great tips! You have been my hero many, many times, but this one takes the cake! I'm due in 5 weeks, just pulled out my old car seat and the outer cover is RUINED from tree sap that dripped from the Christmas tree stand (that hubs was supposed to have cleaned before putting away…:) ) I'm buying fabric TODAY and getting started! THANK YOU SO MUCH!!! I love the color combo, and the yellow flowers on the canopy make it so cute. By the way, I don't think that this is irresponsible or unsafe despite what the naysayers say. It isn't necessarily safe to put a blanket over a baby in a car seat (though we all do it), especially when they are rear-facing in the car and you can't see them, since it could come up somehow and cover the baby's mouth and nose leading to suffocation. And who knows what that blanket will do if you are in a car accident? That is an awfully cute cover, but I have to agree with the others that say it's unsafe. I used to think that making a big deal about flame retardant materials in carseats was just some silly government regulation, until the day, one of my daughters used a magnifying glass on her sister's carseat. It happened when I'd stepped out of the car for a minute. If her seat cover had NOT been flame retardant, she would've been in flames fast. It could have been a horrible outcome! But instead, only a very small hole was burned in the cover of her Britax seat. It totally bugs me that her seat has a small burn hole in it and I am an experienced seamstress so I could've easily made a new cover. But I haven't. a) because I don't want to hassle finding flame retardant fabrics and b) because her life's FAR more important than a cute carseat, so I'll live with the one with a small burn hole. It's a good reminder that safety is FAR more important than something being in style or pretty. OMG …. that is adorable!! you are such a clever girl! I would of loved one of these when my daughter was a baby. I see a market!! This is genius! I absolutely love it! Thank you for the post! Well I just have to throw my two cents in after reading all the comments. First, you did such an incredible job on the cover. It looks so pretty and professional! I'm just learning how to sew, so seeing all that and the steps makes my head spin! I'm impressed. Second, as for the safety of the car seat I see no reason why your modifications would put your baby at risk. In no way do I think you're being irresponsible (as one other person suggested) by using your cover on the car seat. I guess it just rubbed me the wrong way that people would say things like that to you. The suggestion you would be putting style ahead of your baby's safety is, well, vulgar. Until a car seat safety expert comes around to tell you it's unsafe, I think we can all happily ignore the other people. Hey, listen SERIOUSLY!! READ THE MANUAL!!! It specifically says ANYTHING AFTERMARKET VOIDS THE WARRANTY!!! PLUS, most insurance companies will not replace the seat OR pay for any injuries to a child IF YOU ARE USING A SEAT THAT HAS AFTERMARKET PIECES!!! Your ‘pretty’ seat is obviously WAY MORE IMPORTANT to you than your pretty child, because you have completely disregarded this guide line!!! Smh because it’s RIDICULOUS!!! that you would be so worried about a pretty seat and NOT using it CORRECTLY!!! Ashley – you are so talented. I want to recover my carseat now! You make it look easy, but I have a feeling I'd get mine all torn apart and then wouldn't be able to figure out how to put it all back together! :) Thanks for sharing this tutorial. Looking forward to hearing about the arrival of your sweet baby girl. I know many people think that some of us who have commented about the seat not being safe may think we are overreacting and I just wanted to put out a little more information. I am a CPST (child passenger safety technician in case you're not familiar) which means I've had training- and continue to have training- to help parents install car seats. Until I had an interest in this field and took the class I had no idea that so many kids weren't properly restrained in their car seats- at least 80% of car seats aren't used properly. Which means there is a good chance that the majority of the people posting here could be in this group (not accusing, just based on the statistics, hopefully everyone is doing it right). Maybe these things just aren't as important until you have seen everything from a different view, but car seat safety is imporant. Children die from the misuse of car seats, even if it's only one child a year that is still someone's child and maybe that parent's negligence that could have caused it. Just please don't say you "think" it will be fine (like so many commenters have said) what are you basing this on? Just your opinion? Absolutely Fantastic! I think I might just do this to my old carseat for the new baby coming! Thanks for the tutorial! I've had my eyes on a carseat cover that is giraffe print with pink accents. It's $70 so I just can't justify that price. Though your tutorial was fabulous and incredibly detailed, I doubt I'll recover my carseat anytime soon. Your seat is BEAUTIFUL!! I bet you'll get tons of compliments on it! Wow, really people? Being helpful doesn't have to mean being rude. I think if you have something helpful to say at least be nice about it. Like another commenter said, we are all adults capable of making our own decisions and what one feels is a good decision for herself doesn't mean than anyone else has to agree with her. If you don't like it, don't do it. Plain and simple. And for the record, she did talk about using flame resistant materials or spraying your fabrics to make them flame resistant. I, for one, think if you're going to have some beef with someone misusing a car seat then your time would be better spent focusing on the parents who do not know how to properly install a car seat or the parents who choose not to tighten the straps after buckling the straps because it's "too hard after the baby is buckled in." Real life story. Rachel — what you are talking about has to do with the installation of the carseat not the carseat cover. Those are two different things. If you have useful information about the cover that would show this is unsafe, then please offer it. I think that most people offering their opinions that they "think" this is okay is because the cover was created in a meticulous way specific to this carseat using the original cover as the pattern. It wasn't just slapped together as some cover to be used for all carseats. This is coming from someone who is very careful about carseats. I thoroughly read the user manuals and make sure I install and use them correctly per the manual. I'm sorry there have been so many negative comments on such a fantastic project that I am absolutely going to tackle myself. It's is so beautiful and you did a wonderful job making it all your own. And to the Negative Nancy's are you really out to be helpful, making sure she isn't liable if someone makes this themselves or just to toot your own horn because you don't like it? The disclaimer is perfect just like all of your projects. P.S. Who in the world lets their kid get in the car with a magnifying glass and leaves them in there even for a second. Sorry but that's more concerning to me! To Craftaholic! You couldn't have said it any better. Amen! Wow! That is one amazing cover. I love every bit of it from the design, colors and print! Hi i LOVED the carseat that you just did. I was wondering do you make custom ones for other people? I have one that my daughter used for not too long and i wanted to make it for a boy. And i am just wondering how much you would charge if you did? All the natsayers like Selina, I feel your concern. But Ashley, this is totally amazing, and I think you did agreat job! All you guys out there, how is this going to kill your child? It is just as safe as factory made carseat covers, and furthermore, my little sisters carseat is built like a battlepod. The carseats these days are practically impossible to be killed in. So realax, y'all. RELAX. Ashley did this because she wanted to add some glam to her little one's life. If you don't like it, go find some other blog to follow. Some words from a young girl, liking this tutorial. AMAZING!!! I love your posts. I love your blog. Now it's my most favorite! wow, people can be so mean. Anyway, you did a great job and its just beautiful.There is a lady here where I live that makes and sells covers and whole seat covers like you made. I love that you can be different from the masses! The main safety concern being stated is that the fabric may bunch or compress differently than the original fabric, causing harm to Ashley's little one in the case of an accident. Based on your logic, that sounds far more dangerous. I was not trying to be mean. My point is that you DO NOT know how this will react in a crash. I originally suggested contacting the manufacturer to see what they would recommend and that is what I would recommend doing. They design and tested the seat with a certain fabric, just because it has been made the same way does not mean it is the same. First, I absolutely adore this tutorial as it turned out great! There are so many other things as parents that I feel you should be worried about then this. Heck, what would you say to those who buy carseats at garage sales without knowing anything about them, or numerous other things. Just as someone else said, these companies probably test a couple hundred on a carseat then send that to be mass produced (no less in China) without testing. Have you ever received something from mass production where the seams aren't perfectly sewn, etc. I would say the care I saw in her photos makes me more comfortable with what she produced then in the original. Ashley, I am sure when you posted this you figured the negative Nancy's would show up, but know you did an amazing job! Those saying this has been tested…well nor have all the others just the originals before sending to production. I see so many worse things parents do (you know how we get the warnings…don't put bag over childs head, don't place top on tote with child inside…yeah those). Many best wishes for your new arrival, and look forward to many great tutorials from you! I think some may not be sure how fabric construction works. If Ashley constructed the car seat in the same exact way as the original, it will perform in the exact same way. She used a cotton fabric and while I was at Babys R Us the other day, I noticed that more than half of the designs out now are constructed with cotton material. Especially the GRACO brand, which is the car seat Ashley used, as shown in her pictures. So if hers bunches and acts funny, so will the other cotton fabric car seat covers you buy with the car seats. Cotton is cotton. But the integrity of the padding and compression of the padding underneath that top layer, is the EXACT same…..because she used the original padding. I can guarantee you that the exact car seat cover that Ashley purchased was not tested in a crash test. However, I'm sure that a version of that pattern was and then it was shipped off to whatever foreign country to be mass produced. And was cut out and constructed in a variety of fabrics. Just looking at the seats at Babys R Us the other day, there were many fabric versions of the same style of seat. (And in my opinion, she probably took more care on her cover than the person who thoughtlessly put her original one together in some other country. Have you seen some of the products that come into this country that have been approved for our safety?) So the fact that the top layer of fabric was swapped out but the cover has the exact same layers and dimensions as the original, it's just like the factory doing the same thing before they finished it off and sent it out. Her fabric is cotton. Other seats are cotton (they were probably treated though for fire resistance, which she gave a link to do the same thing if so desired). Same thing. The fabric will not bunch differently, will not react differently, nor will it cause harm in any way different than the original car seat. It is the exact same. The main protection the child is receiving, is from the plastic shell of the car seat. The cover is the padding to give the child comfort while in the seat. If the combination of the two were tested in a crash and passed enough of the crash standards, then the car seat can be sold. If all things considered, her seat cover is exactly the same as the original and will offer the same amount of protection as the one she purchased. But if you don't have much experience with fabric construction, you may not be the one to throw statistics out because certain statements that have been previously posted aren't making much sense. There is no law saying that Ashley cannot swap out the top layer of fabric on her seat. Her chosen brand may, however, decide not to replace her car seat in the event of an accident. And that is her choice. This is obviously an issue where everyone will have to agree to disagree. One parent may have strong opinions on this topic while another parent will have a strong opinion about another. And that's okay. But let's not call Ashley irresponsible or assume that she cares about fashion over safety. What a cruel claim. And because I understand a good amount about fabric and how different fabric types fit and work together (and how products are mass-created in foreign factories) I do understand that the integrity of her car seat is the same as the original. End of story. Great seat cover Ashley! I love your style and I love how you share so many ideas for free, even while some seem so ungrateful. I sure hope you'll continue to post your ideas, though some people tend to use this comment section as their soap box. Especially because this is a free blog where they are choosing to visit, not like a paid subscription that they are hoping to receive certain things for their money. I'm sure none of them would speak like that to you face to face but would instead show a little more respect, even if they disagreed. Seriously gorgeous!!! I knew thought I cared much for yellow- but you made me love it in this beautiful combo – amazing work. Love your blog! I think you did a great job, this is beautiful! I recently recovered a carseat for my sister in law and wished I had taken more pictures beforehand. The upper and lower fitted pieces were giving me a heck of a time until I finally figured them out, pics would have been nice. For those saying they don't have the skills to do this, seriously this isn't that hard. Trust me, I thought it would be until I actually sat down and looked at how it was put together. If you can use a seamripper and sew a straight line, you CAN do this! If you need practice you can always look on craigslist or freecycle for free or cheap carseat covers or even old outdated seats to just practice on with some scrap fabric. I can't see how remaking a carseat cover as carefully as Ashley did is any more unsafe than putting a cover over an adult car seat. No one would blink an eye if you reupholstered your car's front seats but to do it to a carseat is somehow unsafe. The fabric isn't what is protecting the baby after all it is the plastic and sometimes metal frame around the baby. It is the belt buckle and straps, not the 1/4" of batting and fabric. You've got me eying my toddlers' car seats now. If only I knew I wouldn't have to go anywhere for a month! lol. Once again, you outdid yourself. Ashley, you are an amazing seamstress and I am grateful for your generosity in sharing your projects with us. I would highly suggest that a note be put on the post that if this is done that they should have the car seat covering be checked and approved by the appropriate local authorities just for the parents safety and if something should happen in the future it wouldn't be questioned. Just to clarify my earlier post, what it means when you re-cover an infant car seat is not necessarily that it might not function correctly. This one is made beautifully and with the original padding so it is likely to function exactly the same as the original. If it was different padding or it was thicker or whatever, it might not function correctly that could potentially be dangerous. But, what happens when you re-cover your car seat, even with the same batting as is with this one, your warranty is voided and if you were to get into a car accident, not only could your insurance company refuse to replace this car seat, they could also refuse to pay for any injuries your child sustains because you altered your car seat. The manufacturer of the car seat, also, might not be liable for any injuries your child sustains, even if you feel the car seat malfunctioned. So, when you replace your car seat cover, even with the original batting, you basically put yourself in jeopardy of having to potentially pay out of pocket for any injuries your infant might sustain in that car seat, in the even of an accident. That is not worth the cost! A pretty car seat is not worth it! You did an awesome job, and I am so impressed with how careful you were to keep with the exact pattern. I know there are several commenters who opinioned you were making the car seat less safe, but I would bet the cover you altered is much better sewn than the original (and so much cuter!) I hope you don't let the negative comments keep you from sharing your awesome patterns or sway you from sharing more patterns/tutorials. I know I'm not alone in saying you are truly appreciated and admired for your remarkable talents! I am excited to use your tutorial to make a new cover for my little one arriving next month. Ashley, it looks beautiful. And not that my opinion matters, but I agree with Andrea from Washington. I think it's obvious that you are a responsible and intelligent person, not to mention a loving and conscientious mom, who's not going to do something like this to a baby's car seat on a whim. I'm not saying there couldn't be danger–because I don't know. I'm no expert. But I hope you're not listening to the people who aren't thinking before they type, or who think you're responsible for everybody's warranty just because you put an idea out there. I'm sure the concerns are sincere; if you want to check into any of them, that's your business. Anyway. I guess I just added myself to the drama. But please, everyone, don't say mean things, and don't assume. Awesome tutorial. Car seat companies need to get on board with using cute fabrics! As for the safety of using it, all I have to say is that as a parent, everyday you have to weigh pros and cons. This is not a forum to bash the poster for her tutorial. She included a disclaimer for other parents to read and for them to make a decision for themselves. Great job, I love it. I have a few comments to make. first, the safety of the child in an accident has little to do with the seat cover, it mostly has to do with the harness, straps and where they are located on your baby's body and how the seat is buckled in the car. If someone puts extra padding that makes the baby sit funny which alters the way the straps buckle the baby in, this is likely a problem and a safety risk. I don't see any problems with your seat cover. Second, that lady is incorrectly associating product warranty with insurance. Just because altering the seat cover will likely free the manufacturer from liability, does not mean your insurance company will not pay if your baby is injured in an accident. People customize their cars all the time and void their manufacture's warranties but the insurance companies still have to pay. Insurance is a method of allocating risk and voiding the manufacturer's warranty on your baby seat does not necessarily relieve the insurance company from liability. I am sure the negative comments were just people who have concerns and as a parent I understand. However, I am more concerned about sound logic and facts instead of false accusations. For what it's worth, looks like most everyone has figured this out on their own and will or want to make this cover too! :) Love your blog! Fantastic, creative, professional work here. Very inspiring and well done.